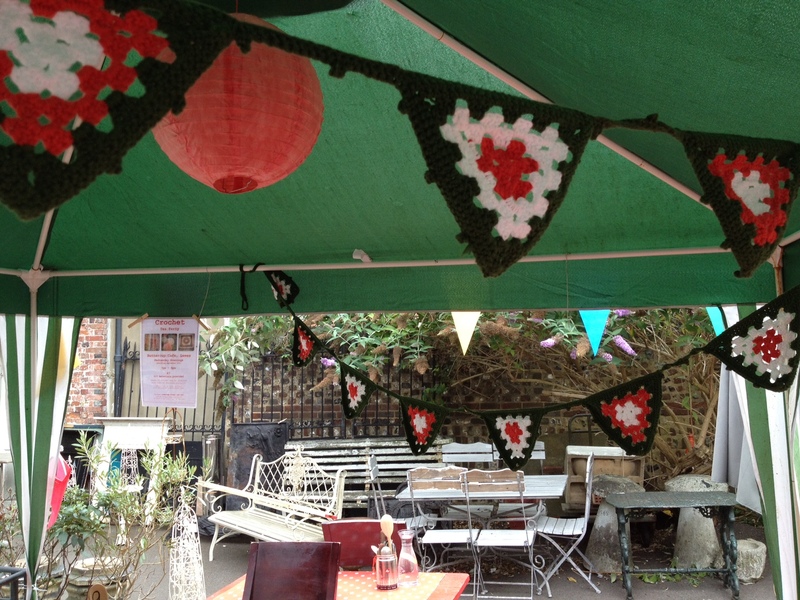 We do love a bit of crochet here at The Buttercup Cafe in Lewes. You’ll have seen the colourful knitted flowers around the cafe recently and our beloved knitted blankets around the yard. 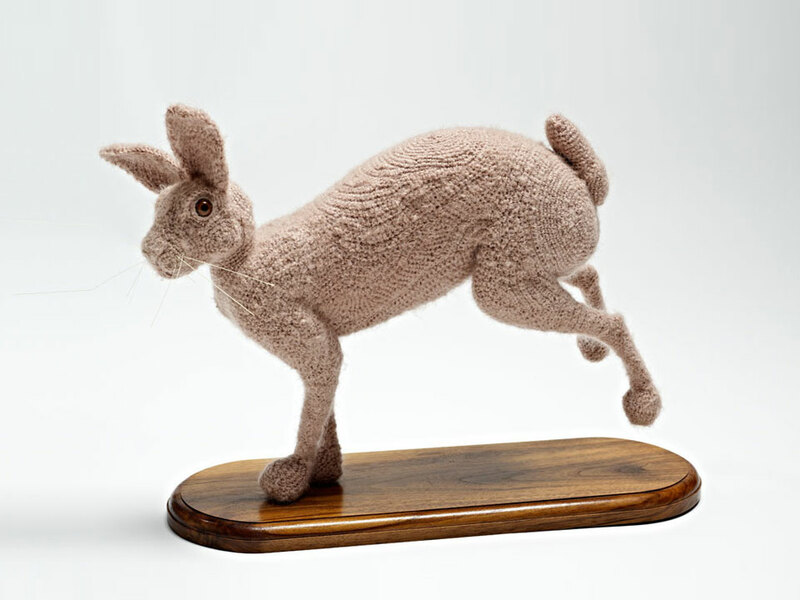 Our great friends at Field & Fork in Chichester have a fantastic exhibition at the moment by Sussex crochet artist Kate Jenkins. Based in Brighton, she creates brilliant and very funny artworks. They really are worth a look at up-close to see the intricacy of her amazing crochet work. 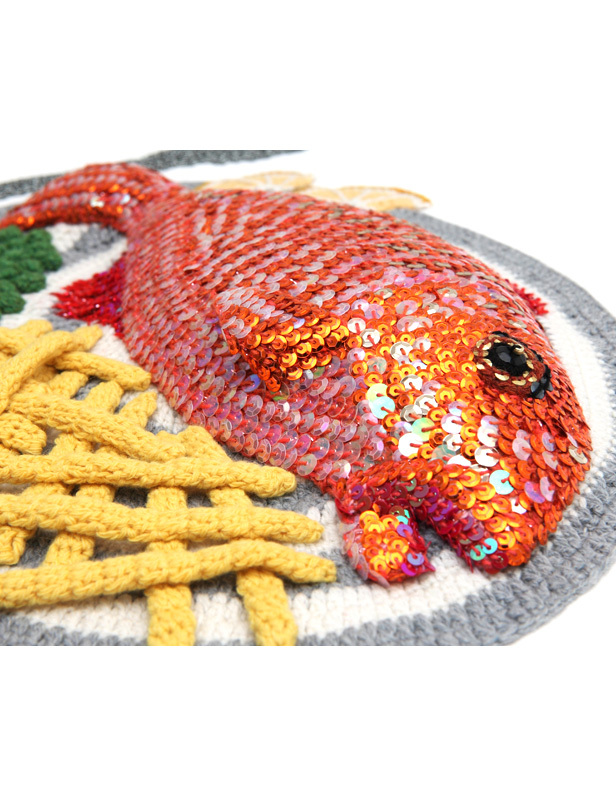 The exhibition called Stitched Fish is on the walls of Field & Fork until 7th October; the restaurant is inside Pallant House Gallery in Chichester. Delicious food and great artwork. Well worth a visit. 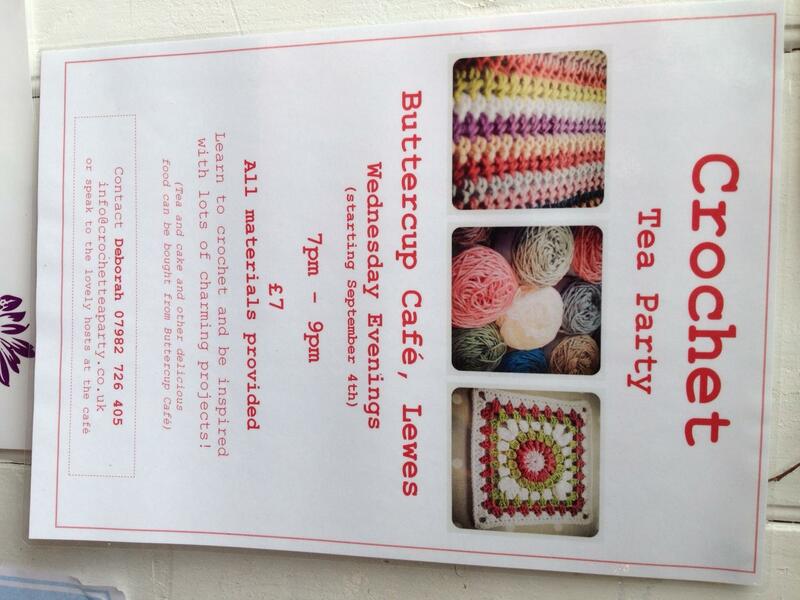 Here in The Buttercup Cafe, we’re partial to a bit of knitting and crochet. 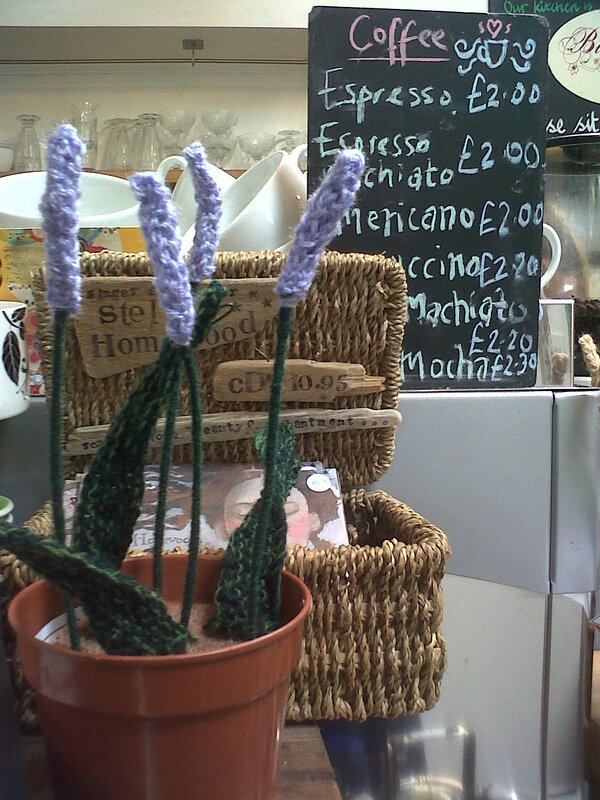 So we were delighted when an artist came through the cafe doors with armfuls of knitted flowers. She goes by the name of Crafty Old Crow and she knits and sells these flowers to raise money for the homeless charity Emmaus in Brighton. You can see her brilliant flowers on the tables here in the cafe at the moment. Her knitted work is included in the Amazing Knitted Garden which is on display on Saturdays during Brighton Fringe 2012 at Emmaus on Drove Road in Portslade. 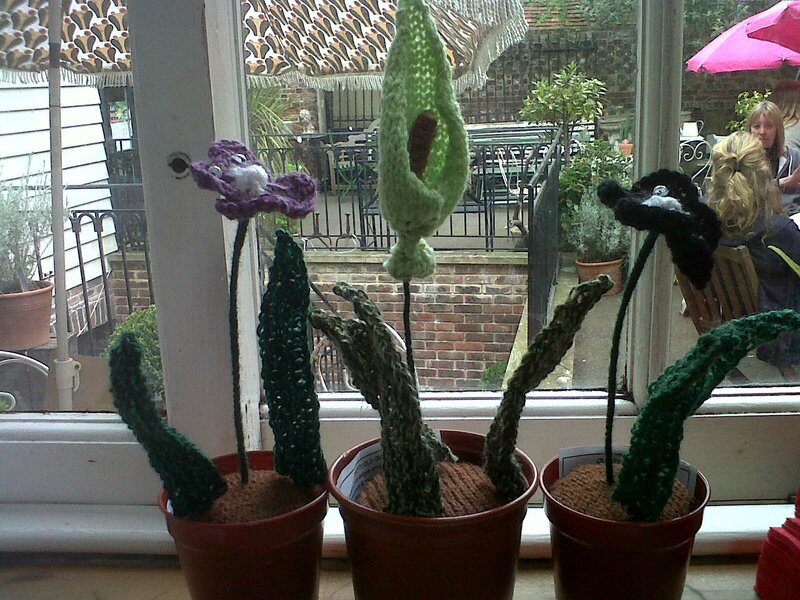 There’s a lovely review and photos of the knitted garden on the Strebergarten blog. Some of the flowers cost just £4. Please do pop into the cafe and buy one to support this fantastic charity and community of homeless people. 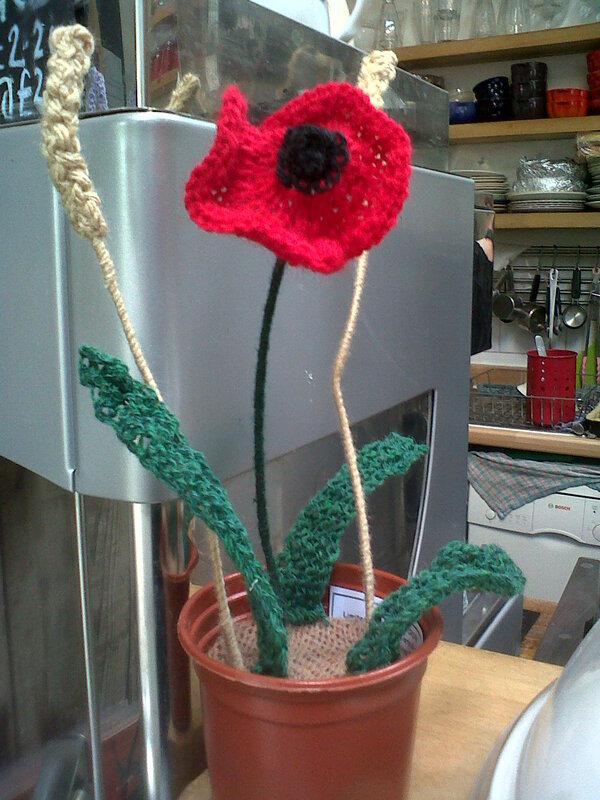 As any of our lovely visitors know, we like a bit of crochet here in The Buttercup Cafe. Something about its colourful familiarity just makes you smile. There’s nothing nicer than a crochet blanket over the knees on a cold day with a cup of hot chocolate. We just came across Shauna Richardson’s amazing work. She’s an artist who creates “Crochetdermy”. 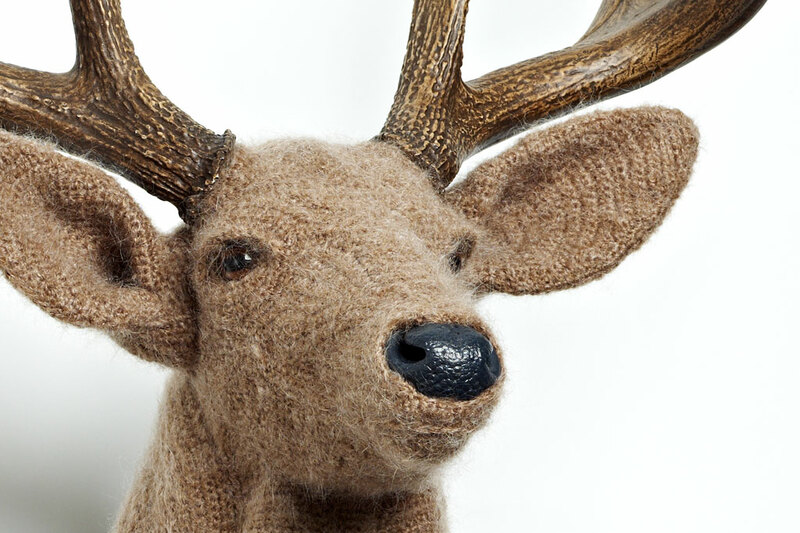 She uses crochet to sculpt realistic life-size animals. We think they’re just brilliant. How can you not smile when you look at these beasts. We’d like one in the corner of the cafe to keep us company. Some of Shauna Richardson’s work is in the The Power of Making exhibition that’s on at The V&A at the moment. So you can see one in the flesh. Or maybe that should be, see one in the knit?? ?